Here are some dispatches from around the state on the first day of early voting. • The number of ballots cast was up 20 percent in Harris County — the state's most populous — over the previous non-presidential election four years ago. The reason, reports the Houston Chronicle's Theodore Schleifer, is a concerted effort by both parties to boost mail-in ballots. "Democrats made a coordinated vote-by-mail program a priority this cycle for the first time, partially because the new, tough voter ID law does not impact absentee balloting. The law's reinstatement over the weekend may disqualify potential Democratic voters, Democrats say, making their vote-by-mail push even more critical," Schleifer wrote. "Democratic- and Republican-aligned groups both sent out equal amounts of the 90,000 vote-by-mail applications in Harris County." More voters were casting ballots in Tarrant County, as well. The Fort Worth Star-Telegram's Anna Tinsley reports that about 10,800 had voted — an increase of more than 10 percent over four years ago. • A ruling from the federal appellate court overseeing Texas ensured that the state's voter ID law would be enforced during this year's general election. One of the law's provisions provided for a free election identification certificate that could be used by citizens lacking the forms of photo ID required to cast a ballot. Whether that form of identification is as easily obtained as the state asserts is one of the central issues in the challenge to the law. And the San Antonio Express-News' John W. Gonzalez points out another potential sticking point — not many folks are getting the certificate. 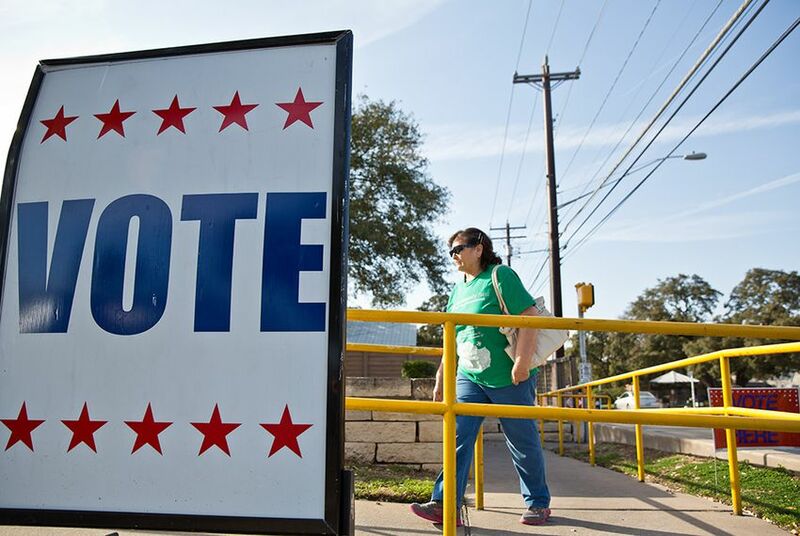 "When early voting began Monday in the state's 254 counties, 304 voter ID cards had been issued throughout the state by the Texas Department of Public Safety, despite intensive efforts to reach any Texans without other acceptable credentials," Gonzalez writes. "Another 1,850 Texans have inquired about the free, state-issued ID cards since they were first offered in June 2013. Many of those requests came from Texans who already had some form of accepted photo ID, making them ineligible for an election ID certificate." • The Dallas Morning News' Gromer Jeffers takes a look at the impact of straight-ticket voting on down-ballot races in Dallas County. Black voters, he writes, are a dependable straight-ticket bloc for Democrats in Dallas County and have helped the county become one of the state's bluest in recent years. For Democratic incumbents like District Attorney Craig Watkins, turnout from this bloc could be essential to his survival. "Watkins trails Republican Susan Hawk by more than 5-1 in fundraising. Without straight-ticket voting, his re-election would be even more questionable. As it now stands, Hawk has a tremendous opportunity to wrest the DA’s office away from him," Jeffers writes. "But Hawk has to hope that the Republican base turns out in better numbers than in 2010, or that she can peel away Democratic Party support from Watkins."